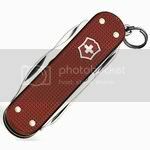 great news from ibach, victorinox will manufacture an limited run of an brand new model, never be done prior, the second 58mm alox sak, an alox rambler! the alox scales will be mainly silver factory alox but some i will splash multicolor and single colors too. as its ready it will be in my newsletter.